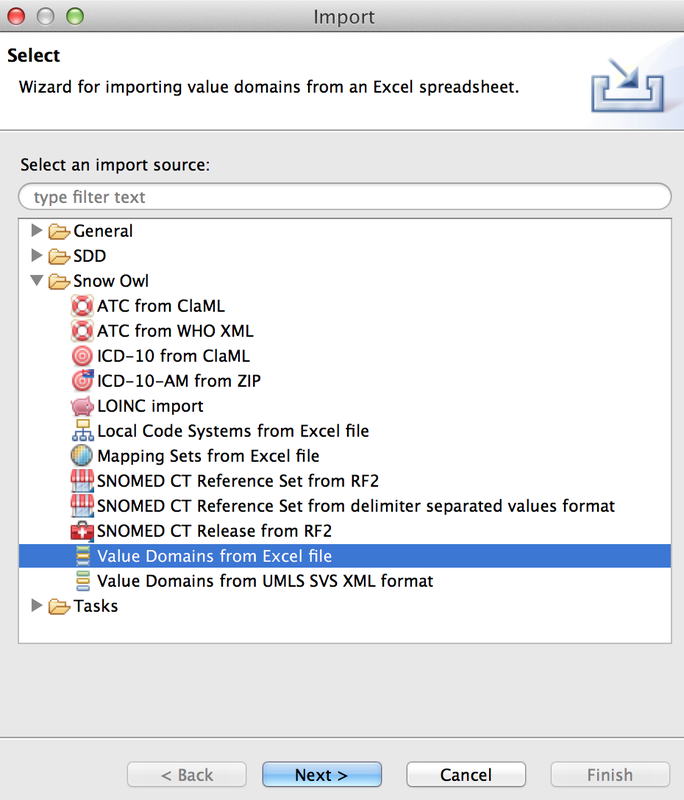 To import a value domain from a spreadsheet go to File > Import > Snow Owl > Value Domains from Excel file, and click Next. Clear: This overwrites the existing VD with imported content, all existing content will be deleted. You should also use this option when importing into an empty database. Merge: This adds new content to the existing database without removing or changing existing content. For example when adding new members to an existing VD, or adding new VD. Replace: This will update the existing VD by adding, modifying, or removing members. This should be used when importing a new version of a value domain. Existing content that is not part of the import is kept and not changed. Click Finish to start the import. If you selected to clear all existing content, you will be presented with a warning. Click Yes to confirm the import. After the import, the wizard displays the imported content. Click on a component to see details in the bottom part. In the screenshot, you can see that a value domain (Language) was updated. The bottom section displays different value domain members and attributes of the value domain that were changed. A small blue minus decorator indicates that a component was removed. The icon indicates the type of component (e.g. for value domain members). The middle section contains details about the import (e.g. user name, date, file name). If you updated a value domain, you can see different versions here. Clicking on a version displays its history in the buttom section. 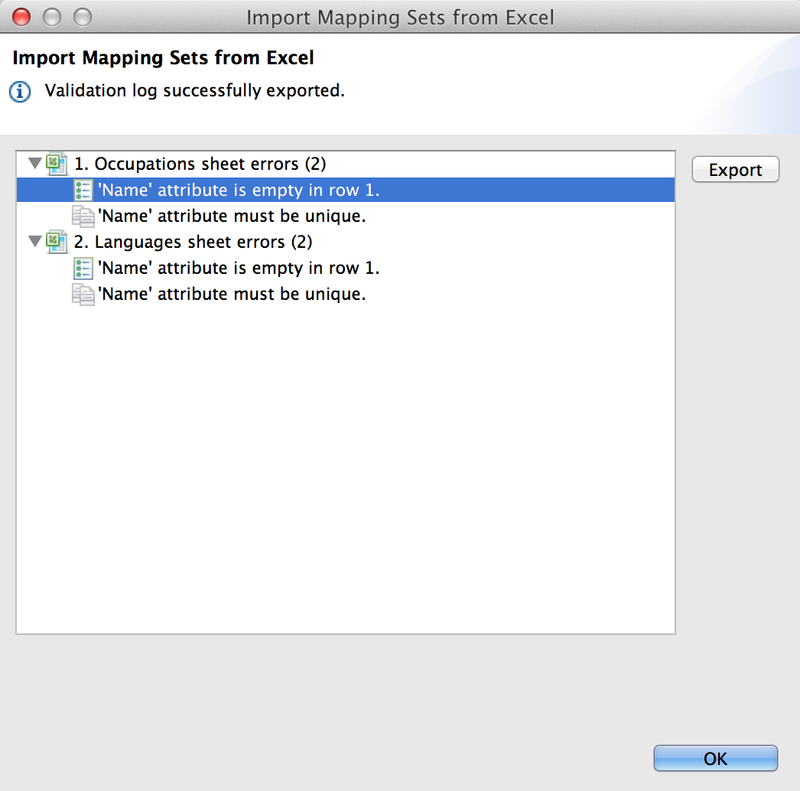 In case of validation errors a dialog is presented at the end of the import. Open the nodes to see which parts of the Excel sheets need to be adjusted, then start the import again. You can export the information as a plain text file with the Export button. The validation is log also available when importing local code systems and value domains. Snow Owl supports importing value domain in the Sharing Value Sets (SVS) format. This allows importing value sets produced by the United States National Library of Medicine's Value Set Authority Center (VSAC) that make use of the Unified Medical Language System (UMLS). These resources are available at https://vsac.nlm.nih.gov/#download-tab ; please choose the SVS (xml) format for the download. 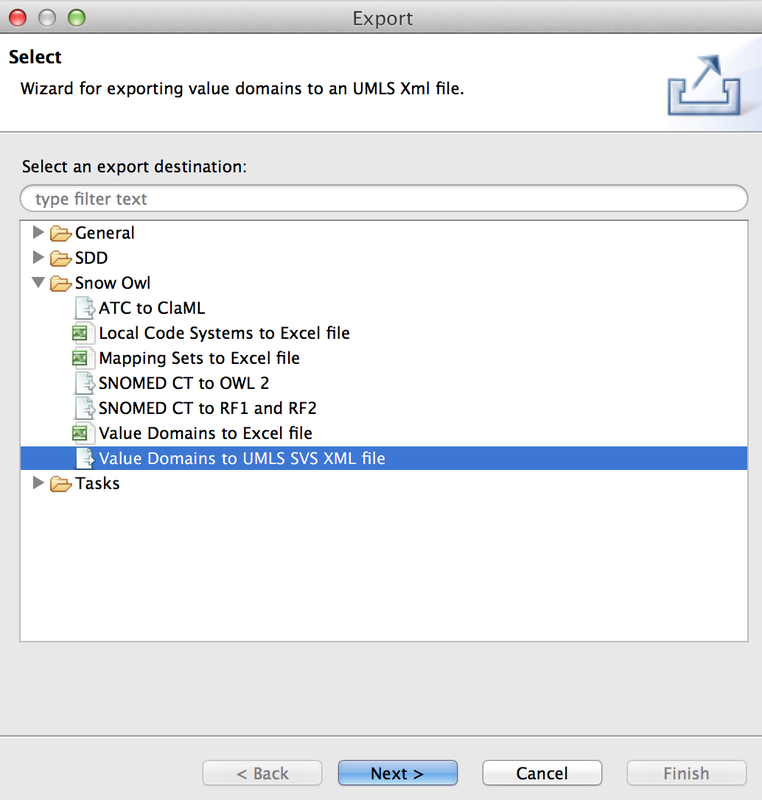 Go to File > Import > Snow Owl > Value Domains from UMLS SVS XML format, click Next. Browse for the file you want to import, select an import option, and click Finish to proceed. A warning will inform you that the import will overwrite all existing value domains. Click Yes to start the import. 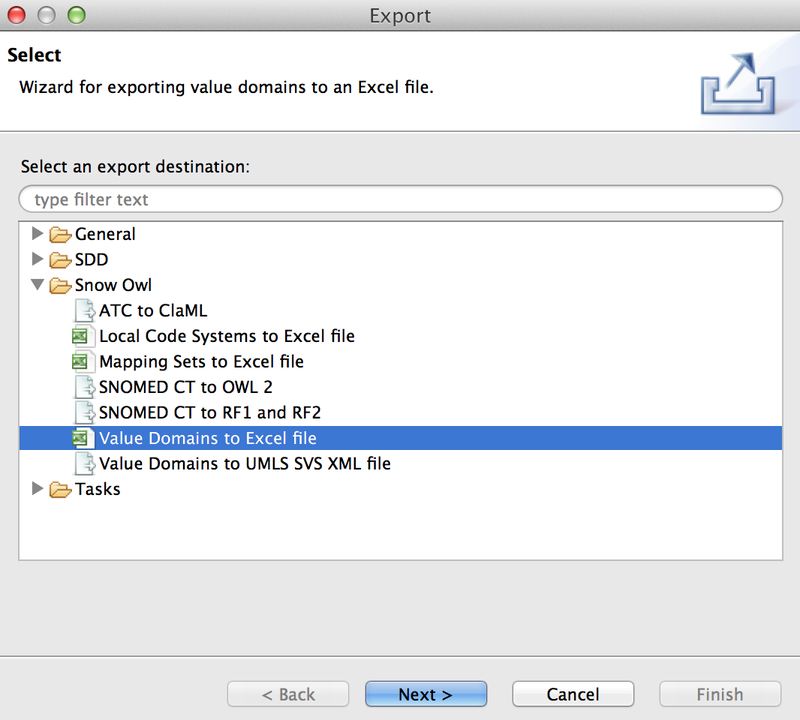 To export a value domain to an Excel file, go to File > Export > Snow Owl > Value Domains to Excel file, click Next. Specify file name and file path, click Next to proceed. 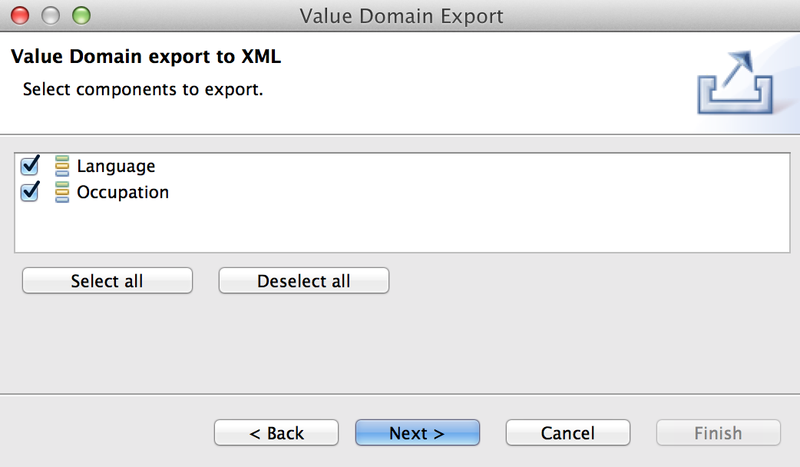 On the next page, all the value domains are listed, check the boxes to select for export. Hit Next to start the export. After the export, you will be presented with a link to the export file. 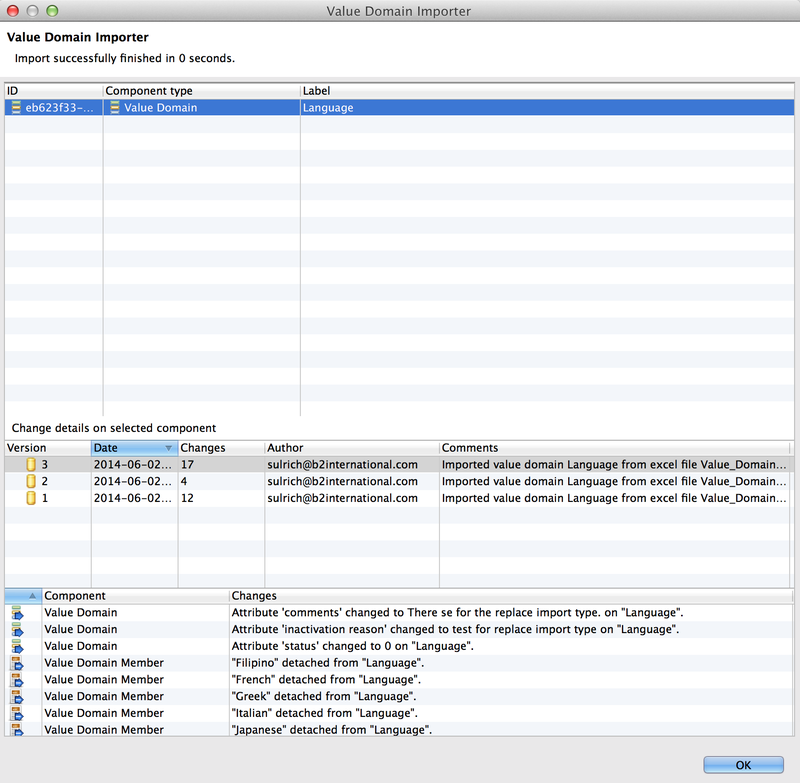 The value domain is exported in standard format (see screenshot). Different value domains are filed in separate worksheets, an index sheet is generated in the first tab of the spreadsheet to allow easy navigation between the tabs. Metadata are exported as additional rows under the mandatory properties. In case of multiple keywords, multiple rows with the same property but different values are exported. Value domains can be exported in Sharing Value Sets (SVS) format. This allows exporting value sets that make use of the Unified Medical Language System (UMLS). 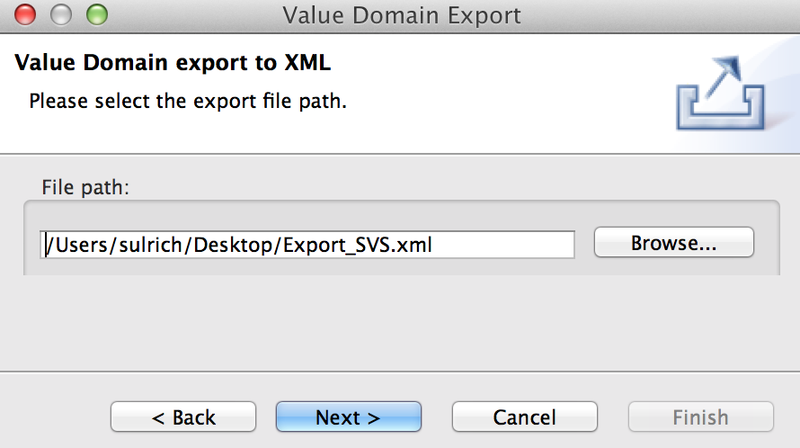 To export a value domain go to File > Export > Snow Owl > Value domains to UMLS SVS XML file, click Next. Specify the file name and path, click Next to proceed.